Third pair in the making. How addictive is this. 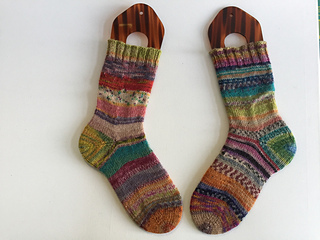 Susan B. Anderson started a KAL making these socks. Pattern: Toe-up. 10 stitches. M1 (every other row) till 58 stitches. Afterthought heel. Used all leftover sockwool. So much fun knitting these. Using the smallest of leftover balls without thinking about matching them. Knitted them two at the same time on two circulars. Wow! Got so many nice comments about these socks. Thank you all! Also some questions about the afterthought heel and joining new colors. I’ll try to answer them here. I just change colors at the beginning of a round. Knit the first stitch with the old thread together with the new thread. This way it is secured. After you have knitted a few stitches you put the two short ends on the inside of the sock and pull them a little to prevent a hole. You can even make a loose knot. You can always undo this knot and pull the threads some more when you are at the point where you have to weave in the ends.